A quick reminder, especially if you are new to the blog here, is that my entire year of Around the World in 52 Books Challenge list has it's own page here. I have been keeping this up-to-date even if other things aren't as much so! I've finished 2 books to report on this week. 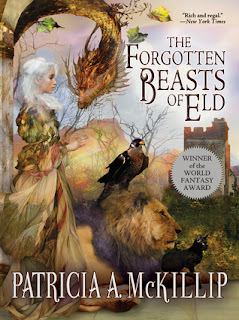 First up is The Forgotten Beasts of Eld by Patricia McKillip. Book Summary: Young Sybel, the heiress of powerful wizards, needs the company of no one outside her gates. In her exquisite stone mansion, she is attended by exotic, magical beasts: Riddle-master Cyrin the boar; the treasure-starved dragon Gyld; Gules the Lyon, tawny master of the Southern Deserts; Ter, the fiercely vengeful falcon; Moriah, feline Lady of the Night. Sybel only lacks the mysterious Liralen, which continues to elude her most powerful enchantments. My Review: I initially felt that this book was a little stilted after reading the first couple of chapters. I was never so happy to be wrong before! I LOVED this one. 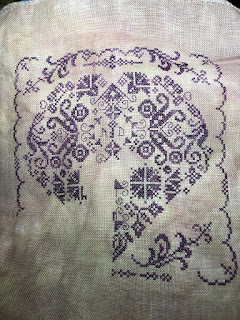 It's magical and mystical, has a wonderful heroine who has all sorts of layers, as well as a romance, lost and found, in the loveliest troubadour-worthy tradition. And the beasts! Such a wonderful collection of personalities and traits. I fell in love with Ter (her falcon), who is everything you might want in a protector. While there is a human love story (which is not an easy path for either of the lovers), this is also a love story of Sybel and her animals. If you haven't checked this one out, go grab is and read it. All the best bits of fantasy and epic quests in one book. Another highly recommended read from this year. Next up is Amy Tan's Where the Past Begins. Book Summary: n Where the Past Begins, bestselling author of The Joy Luck Cluband The Valley of Amazement Amy Tan is at her most intimate in revealing the truths and inspirations that underlie her extraordinary fiction. By delving into vivid memories of her traumatic childhood, confessions of self-doubt in her journals, and heartbreaking letters to and from her mother, she gives evidence to all that made it both unlikely and inevitable that she would become a writer. Through spontaneous storytelling, she shows how a fluid fictional state of mind unleashed near-forgotten memories that became the emotional nucleus of her novels. A very mixed bag of information here. Recommended, I suppose, if you are an ardent fan of her work, but I think there are other better books on the market about the creative process of being a writer and how they pull fiction from reality and incorporate it into their writing.